Are you craving the pack mentality? A group ski holiday might be calling your name. While there’s safety in numbers, group skiing isn’t right for everyone. If you consider yourself a lone wolf on the slopes, you might be questioning whether or not a group ski holiday is for you. We’re here to help. We’ve come up with the pros and cons, survival tips, and some advice for the designated organiser. 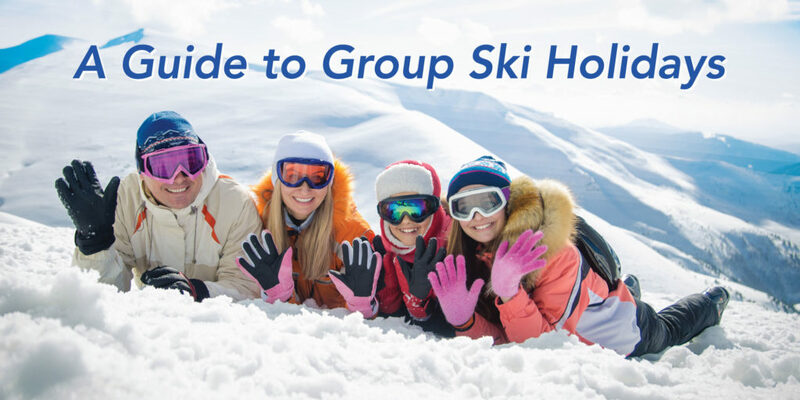 Here’s our guide to group ski holidays. Group holidays have a lot over solo or couple trips. From great photo opportunity to livelier après-ski, the advantages are endless! One major benefit of a group ski holiday? The après-ski is unparalleled. Big groups might mean one round can break the bank, but there’s more people to return the favour. There’s lots of people to stay up until the early hours with, and if some of the group wants to go home, there’s plenty of others staying out! With holidays of only a handful of people, someone is often left out. Everyone’s skiing abilities differ, so one person is often left waiting at the bottom – or stuck at the top. Even if solo skiing is your thing, nobody wants to spend the holiday alone. Group holidays avoid this! With group ski holidays, you’re more likely to secure some money-saving deals. The bigger the group, the more money you’re likely to save! You can find discounts for everything from your accommodation to the ski rental store. Sadly, everything has a downside. With a lot of people to please at once, conflict of opinion can be inevitable. Some people want plenty of off-piste options, others refuse to stay in a hostel, and some have never been skiing before. It can seem like too much hassle than its worth! Some people just want to see the empty slopes ahead of them. While the mountains can be the perfect place to escape to, it can be difficult to get alone time on a group holiday. It’s not impossible – just more of a challenge! So, if our list of pros and cons has convinced you that a group ski holiday is right for you, we’re armed with some advice to make sure it’s the best experience possible. Even for the most sociable among us, group holidays can sometimes be a bit too much. So, make sure you take some time for yourself. If you’re the only one who wants to venture off-piste, go alone! If you need a lie in to feel refreshed for après-ski, meet everyone on the slopes later in the day! You can still play by your own rules, even when it comes to group holidays. Taking some ‘me time’ can also help avoid any brewing arguments, so it’s a win-win. With big groups, one person might be on their first holiday. It’s unlikely they’ll want to take lessons, so they might be braving the slopes without them. The result? You can get roped into being their personal instructor. While no one minds giving the odd skiing tip here and there, nobody wants to spend their holiday teaching someone else. Don’t be forced into giving private lessons all day! Instead, tell them it’s possible to learn to ski in a day and leave them to it. The bigger the group, the livelier the après-ski. Fact. While this can be a good thing, just make sure you’re not the only one getting the rounds in. Getting your wallet out first every time isn’t advisable for keeping costs down. Just make sure everyone pays their share. Also, make sure you ask for group discounts. Remember to haggle! Don’t ask don’t get, right? If you’ve been assigned as the leader to book the holiday, don’t panic. We understand no one wants to be burdened with the organisation process, but someone’s got to do it. It’s your task to make sure everyone has a good holiday. We’re here to make sure you pull it off! Group holidays mean keeping a lot of people happy. Sadly, not everyone in the party will be a pro skier! But, even those who don’t know the difference between off-piste and on-piste need to be catered for. So, pick a resort with a varied range of slopes. That’s not all! Make sure to choose a resort with a variety of activities to do off the slopes. Some of your group will be keen for après-ski every night, others will prefer the quiet fine-dining experience. Ensure you keep everyone happy! Do your resort research thoroughly. Where you go will make or break the trip! This one sounds obvious, but it’s forgotten too easily. When it comes to group holidays, always book early. With big groups, the early bird catches the worm. It’s as simple as that. Accommodation gets booked up quickly, and the best deals get snatched up. To avoid this, book well in advance! If you’ve been challenged with the task of booking the holiday, make sure everyone is committed. You don’t want people cancelling last minute! Trying to pick a date will prove to be the toughest challenge. With group bookings: majority rules. Go with the date that most people can do! If anyone seems unsure, or is wavering on saying yes or no, give them an ultimatum. Tell them they have to make up their minds – or they’re not coming. Holding your ground will do you a lot of favours in the long term. Collecting a deposit from everyone is good way to make sure they’re committed to the holiday. Once they hand over the cash – they’re in for the long haul! With group bookings, there must be a leader. If it’s proving too much to handle, assign someone else to be in charge. If you’re up to the task, always keep on top of things. Ignoring any emails or leaving everything to the last minute isn’t recommended! With group ski holidays, choose the accommodation well. Don’t go with the first option! If everyone’s on a tight budget, hostels are a good option. Hotels will allow you flexibility if anyone cancels last-minute, or if someone changes their mind and decides to join in. Alternatively, if you’re looking for plenty of facilities and the fine-dining experience, luxury ski chalets are a good choice for group holidays. With group bookings, there’s a lot of people that need to get to the resort! Trying to organise everyone onto public transport can feel like herding sheep, so private transfers are definitely the better option. Let someone else do the hard work! At Alps2Alps, we operate a professional, affordable transfer service to all major destinations in the Alps. You can rely on us to get you safely to your chosen resort! Find your low-cost transfer here.